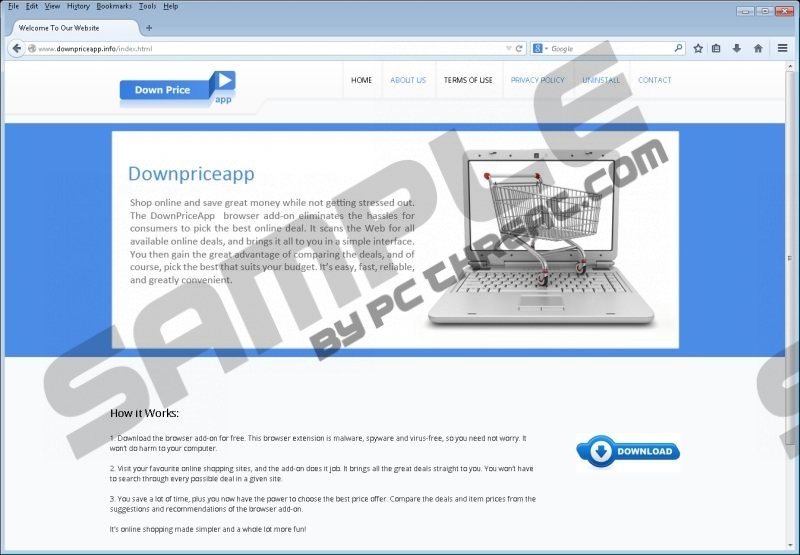 Downpriceapp is an adware program that comes bundled with potentially unwanted programs. It can also be downloaded at downpriceapp.info. It is rather rare to come across an adware application that has a functioning direct download link. However, it does not give you a reason to trust Downpriceapp because adware applications are always highly vulnerable to third-party exploitation. If you do not want to get exposed to dangerous websites, you have to remove Downpriceapp from your computer right now. While you are at it, run a full system scan with SpyHunter free scanner in search for other potential threats. Needless to say, the official website is not the only place where you can download Downpriceapp at. Just like its predecessors from the InstalleRex-WebPick group (including Deal4Real, DealEXpress, CoupExtension and many others), this program also travels bundled with fake Java and Adobe Flash installers. Have you ever noticed a pop-up that offers you to install a new version of a Flash player, or an update that would allow you to watch HD videos online? If this pop-up comes from a random adware-supported website, there is a big chance that it is not safe. Clicking this pop-up would automatically initiate adware download onto your PC. It would not be surprising if Downpriceapp would get installed on the system too. All of the adware applications from this group claim that they are here to improve your online shopping experience. Downpriceapp is supposed to collect all the coupons and discount deals on popular online shopping malls and then provide you with the list when you access a particular supported website. However, we cannot be sure that the Downpriceapp ads are safe. This application does not generate the ad content itself – it relies on a third-party ad server. Hence, if the server gets compromised by cybercriminals, Downpriceapp could get embedded with corrupted links to unreliable websites. After all, Downpriceapp does not review the ad content because it is not responsible for the third-party links. Therefore, if you are not careful enough, you might get redirected to dangerous websites. It is also possible to get infected with malware, although that is an extreme case scenario. Either way, you should not take any risks. You have to remove Downpriceapp from your computer right away. Please take note, that this program randomizes its name when it gets installed on a target computer, so the extension on your browser might be called DownNpriceapp (or any other randomly capitalized variant), but it is still the same application that must be removed. If Downpriceapp came bundled with freeware, it is also possible that you have installed more than just one unwanted application on your computer. Hence, invest in a reliable antispyware tool to determine which programs have to be removed, and safeguard your system from similar threats in the future. Select Uninstall a program and remove Downpriceapp. Go to Uninstall a program and remove Downpriceapp. Disable and remove Downpriceapp from Extensions. Go to Extensions and remove Downpriceapp. For any further questions do not hesitate to leave us a comment in the comment box. Quick & tested solution for Downpriceapp removal.